Samia Halaby, Sama Alshaibi, and Khaled Jarrar are included in the 3rd edition of the Qalandiya International Biennial, a month long program for contemporary art that will take place 5 – 31 October 2016 at various sites in Palestine. The 2016 biennial is titled This Sea is Mine and features the works of internationally renowned artists who explore the theme of return. Halaby is represented in Ramallah with black and white paintings on raw canvas. The Return series (2016) evokes the movement and energy of displaced communities that unite to form a dynamic force. 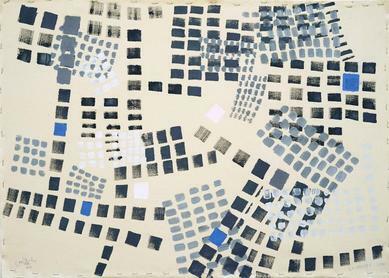 According to Halaby, although this new body of work is inspired by the Palestinian Right of Return, it also addresses the ‘idea of return to home of all migrants evicted by war.’ Concepts such as ‘organizing, pathways, patterns, attraction, infiltrate, and emerge’ are reflected in the titles and compositions of her paintings. Four works from Alshaibi’s critically acclaimed Silsila project (2009-2016) are highlighted in the portion of the biennial that is organised in historic Palestine. The photographs show the artist retracing Ibn Battuta’s travels through North Africa and the Middle East, specifically along the path of scarce water resources that are currently threatened by encroaching wars and conflicts. In the context of the biennial (and in Haifa, where they will be displayed), Alshaibi’s images speak to occupied and internally displaced Palestinians, whose access to water diminishes more and more every day.